Surgeon-in Chief, UMass Memorial Children’s Medical Center, Worcester, MA. 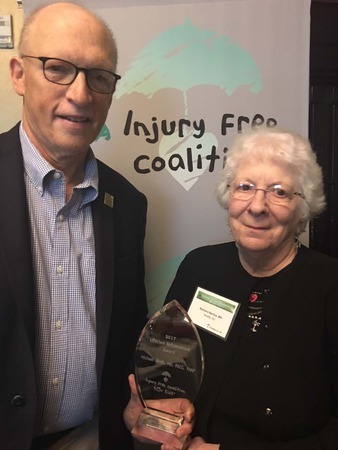 Ft. Lauderdale FL, December 3, 2017 -- During Forging New Frontiers, the annual conference of the Injury Free Coalition for Kids this week, Michael P. Hirsh, MD, FACS, FAAP received The Coalition’s Lifetime Achievement Award recognizing his 30 years of work in the field of Injury Prevention. The Professor of Surgery and Pediatrics at UMass Medical School and Surgeon-in Chief of the UMass Memorial Children’s Medical Center in Worcester, MA. is also Division Chief of Pediatric Surgery and Trauma and Associate Surgical Director of the Trauma Center and Pediatric Intensive Care Unit. His career has focused on the development and implementation of innovative interventions to prevent pediatric injury and address firearm injuries. Following the loss of his best friend to a firearm injury, he became the co-founder of Goods for Guns, a firearm exchange program that has taken more than 3,200 guns off the street over the last 15 years. In 2012, his prevention work led him to be invited to serve as the Medical Director for the Department of Public Health for the Central Massachusetts. Regional Public Health Alliance, a consortium of seven municipalities in Central Massachusetts including Worcester, New England’s 2nd largest city. Injury prevention is now one of the five top priorities of the regions Community Health Improvement Plan (CHIP) aiming to make the region the healthiest in New England by 2020. "Early on in my Pediatric Trauma experience I realized that without devoting a significant part of my energy to Prevention I would be relegated to running a MASH unit patching up injured kids and sending them back out to be injured again,” Dr. Hirsh explained. “The methodology of Dr. Barbara Barlow, the Founder and Executive Director of the Injury Free Coalition for Kids gave me the model to mimic and I was on my way. He went on to say this award is a wonderful recognition of that path having yielded some positive impacts. Dr. Hirsh‘s work has established a number of programs that have been instrumental in improving the health and safety of children by preventing injuries both in his communities and in communities across the country as they have been instituted in other places. Among them are: gun buyback programs, teen driving programs, and Safety Street, a Mobile Safety Street program that mobilizes community facades to teach children about safety in their home, on the street and in their community. His commitment and programs have attained national recognition.